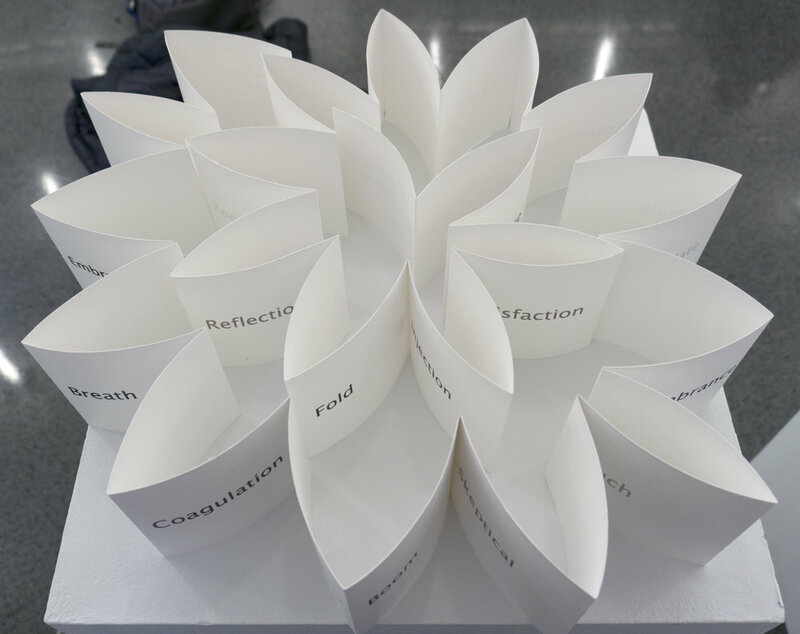 Proximation Annotations records two artists’ physical and cognitive exploration of each other using words. This piece is a reflection of the factual and subjective embodiment of existence. During the exploration, both artists are blindfolded and have to use sonic and haptic feedbacks in addition to personal imagination to perceive each other. Body movements are captured as positional and rotational data. While technically, the data is processed to measure how frequently the two artists touch and move around each other; subjectively, it measures their comfort level to navigate around another person. The two artists then individually provide an index of 40 words, composing the Intimacy Scalar, in which each word represents one state in interpersonal relationships. Finally, Proximation Annotations is visually sequenced and designed by integrating the measure of comfort level (variance in movement frequency) with Intimacy Scalar. Proximation Annotations encompasses the growing dynamics between two artists throughout time as beating poems with varied transparency across pages. Proximation Annotations is a collaborative project between Ann Yu (Northwestern University, BA, Philosophy and Computer Science), and Snow Xu (School of the Art Institute of Chicago, BFA, Art and Technology Studies). To signify two artists' subjective perception of interpersonal relationship and meaning of "intimacy" (possibly affected by their different life experiences and personalities, etc. ), each one of them provided an index of approximately 40 words, embodying the Intimacy Scalar. While the first word (e.g. 'Curious" in Ann's Intimacy Scalar, shown below) designates the stranger state, the Intimacy Scale increases as you proceeds down the column, which leads the last word (e.g. 'Sympathy' in Ann's Intimacy Scalar) to represents the stage of ultimate intimacy between two human beings. In this project, the ASCII sign "/" is adopted to symbolize the touch, interaction, mutual penetration and interpretation, active collision and liquid fusion of personal boundaries during two person's interaction. In mathematics and contemporary computer semiotics, "/" can be understood as "divided by", which is the division of the number before "/" by the number after "/". Thus, by extending the definition of "/" to encompass the hardly quantifiable parameters of interpersonal interaction and ever-changing identities, the artists attempt to explore the subjective reception, digestion, abstraction, distortion, and dissolution of one individual by the other, directed by evolving relationships between the two. In order to quantify the level of comfort, standard deviation of the tracked person's movement every 5 seconds, aka the frequency of changes in movement every 5 seconds, is designated as a numerical measurement of willingness to express and explore around another person. The data is processed with programming in Mat Lab. The 1st column shows the Intimacy Scalar in its original order. 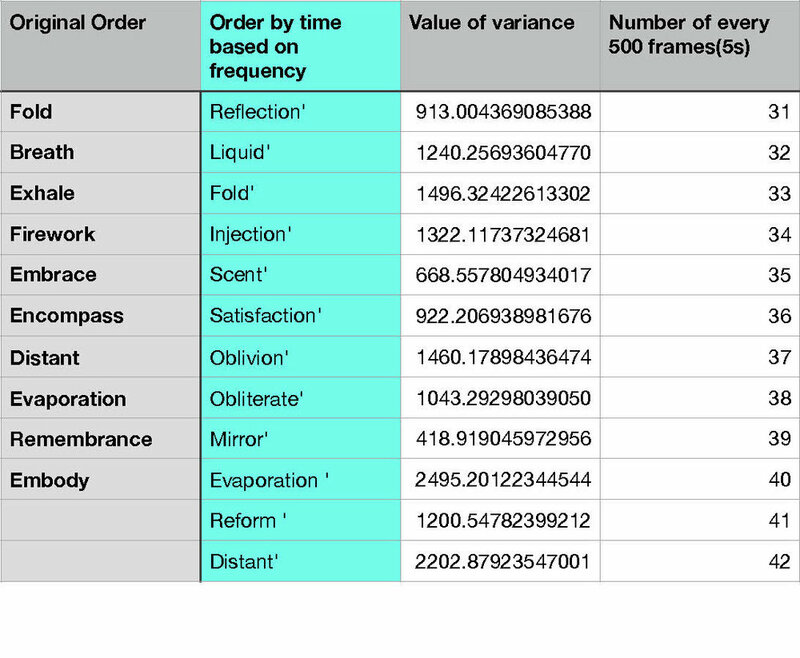 The 2nd column displays the final sequence of Proximation Annotations generated by Mat Lab algorithm, ordered based on value of variance (frequency of changes in movement) adjacent in 3rd column. During final design of Proximation Annotations, it is considered important to showcase the original order of 2 Intimacy Scalar. In an effort to preserve the simple and concise format of visual poem with black text on white paper, a deicision is made to appropriate increasing opacity for words further down the Intimacy Scalar. E.g. In the previous demo of Ann's Intimacy Scalar, "Curious" will be the most transparent and "Sympathy" will be the most opaque. The variation in transparency successfully alludes to the ambiguity of one's perception and understanding of another person with its visual vitality. While strangers are almost transparent to each other, progressing interaction and growing understanding transform one into solid and tangible characters. Additionally, objective facts about the two artists are incorporated as the front covers of Proximation Annotations. In contrast to the subject-ified cognition of one by others, factual information on the covers becomes both birth certificate and death certificate of the individual at that very moment of data generation. Proximation Annotations is exhibited at Data Viz Collaborative Exhibition at SAIC's Neiman Center in December, 2017.